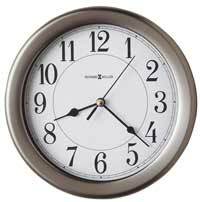 The Howard Miller Arendal 625-377 Wall Clock is a curvaceous wall clock and features carved accents and a turned urn finial which complement the unique style. Finished in Tuscany Cherry on select hardwoods and natural wood veneers. The aged, antique style dial offers black Roman numerals and decorative black hands. Originally designed as a special 80th Anniversary Edition Clock for Howard Miller. The wooden stick swinging pendulum features an antique-brass spun bob. Powered by 2 "C" size batteries. Quartz, dual chime movement plays switchable quarter hour Westminster or Ave Maria chimes. Volume control and automatic nighttime chime shut-off option. Size: Height 29-1/2", Width 9", Depth 4-1/2". 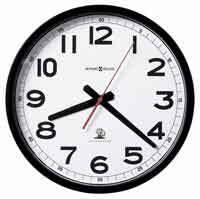 Clocks for sale at The Clock Depot including the 625-377 at discount prices.